Item # 314661 Stash Points: 395 (?) This is the number of points you get in The Zumiez Stash for purchasing this item. Stash points are redeemable for exclusive rewards only available to Zumiez Stash members. To redeem your points check out the rewards catalog on thestash.zumiez.com. 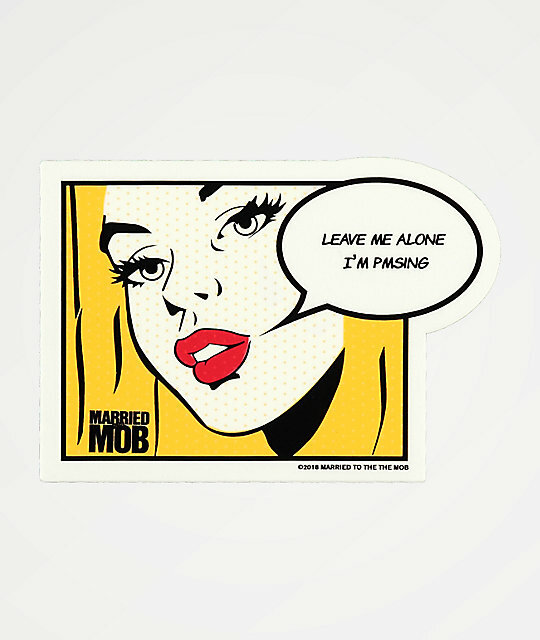 Warn everyone what time it is with the Leave Me Alone Sticker from Married To The Mob. Featuring a peel and stick adhesive for easy placement, and a graphic of a girl with text that reads "Leave me alone I'm PMSing," this sticker really makes a statement. Leave Me Alone Sticker from Married To the Mob. 4.5" x 3" &vert; 11cm x 8cm approx. diameter.